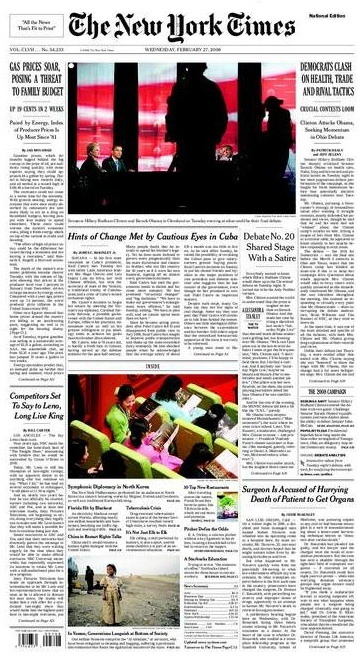 On Monday, the New York Philharmonic’s trip to the DPRK was on the front page of the Arts section of the New York Times. On Tuesday, the day of the NYPO concert itself, the trip was on the front page of the main section, reporting on the concert that the Koreans had put on for their American guests the previous day. The next day there was still room for a photo on the front page of the main section (right), while the reports of the NYPO concert were on inside pages. The FT, as the only UK newspaper with a permanent bureau in Korea, was well placed to provide coverage, and Anna Fifield made the trip to Pyongyang to report on the historic act of cultural exchange. She also broke the news of the invitation to Eric Clapton to visit Pyongyang — in return for the North Korean State Symphony Orchestra’s planned visit to London later this year. Kim Jong-il’s second son Kim Jong-chol is a well-known Clapton fan, having been spotted at a Clapton gig in Germany in the summer of 2006. They came bearing bows and basses rather than the arms and armor Americans carried the last time this large a contingent set foot in the North Korean capital. Hostile states do not usually send their best oboists across the border to infiltrate the enemy. We just went out and did our thing, and we began to feel this warmth coming back… It was a stunning reaction. We haven’t seen that kind of enthusiastic reaction in a long time, and we have had some very successful concerts. The 5 minute ovation was brought on primarily by the final encore, an Arirang. The next day Maazel conducted the North Korean State Symphony Orchestra in an informal masterclass. Maazel was “totally blown away” reported the NYT, which also rather churlishly added that the musicians “had clearly rehearsed to within an inch of their lives”. The Americans said the North Koreans played with flexibility and responsiveness, matching their subtle shifts in tempo, blow pressure and vibrato, and used body language to communicate. [The NYPO principal cellist] called them “consummate chamber musicians” who played without tentativeness. As the piece closed, the applause was electric. And it put on full display something rarely seen in North Korea: spontaneity. The entire audience was on its feet but this time it was not just the women in traditional dress who were smiling, it was the previously implacable bureaucrats too. It’s not going to cause regime change, but will help to change perceptions. I noticed that one had a choice of live television feeds from Pyongyang of the concert. The one we watched most of the time was from CNN who got their feed from the [North] Korean Government. The other feed was from MBC. When I was watching the first part of the concert and switching among channels, I immediately noticed that the MBC broadcast was ahead of the CNN broadcast. In other words, there was a time delay within the DPRK broadcast whereas the MBC broadcast was a true live feed. Furthermore, as the concert came to the end, those of us watching CNN saw the image abruptly switch to a N Korean talking head commentator for a half second before CNN resumed its programming. We then switched over to MBC where we could watch in progress the prolonged audience and orchestra post-concert interaction. In other words, those North Koreans who were fortunate to have electricity running were able to watch just the concert and no more. Those who experienced or witnessed the emotional interchange were purposely limited to the elite who comprised the audience and the outside world.